Have you been told that there are aborted babies in vaccines, or that aborted foetuses are sold by the hospitals to vaccine manufacturers? The simple answer is that this a blatant and outrageous lie. To make some vaccines, the vaccines viruses are grown on descendants of cells removed from 2 foetuses aborted for medical reasons half a century ago. The foetuses were not aborted intentionally for the purpose of vaccine development. The foetal cells were used to begin the cell lines which have since divided and multiplied independently. The descendant cells never formed part of the original foetus. In nature, viruses need cells in which to grow and reproduce in and in order to make an effective vaccine against these viruses, vaccine makers need to grow the virus inside actual cells (such as in chicken embryos or animal cells). Sometimes they use cells descended from human tissue because it is very hard for some viruses that infect humans to be grown in any other type of cell, and during the vaccine manufacturing process the virus has to be grown and replicated as part of the way it is weakened (attenuated) so it cannot cause disease people. Once replicated and attentuated, the vaccine virus is then extracted and isolated from the growth medium. Human foetal cell lines are used rather than adult cell lines because they divide much more rapidly, and it is safer to use human originated (rather than animal), cell lines for development and manufacture of vaccines for humans. Four of the vaccine viruses – Hepatitis A, Varicella, Rubella and Rabies, use a growth medium of human cell lines, and in those vaccines, cells descended from foetal cells are not an ingredient but a growth medium. 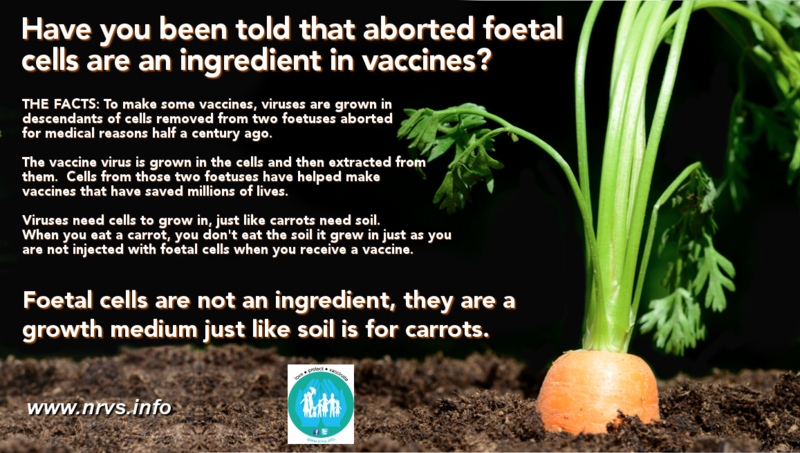 Much like how carrots need soil in which to grow, vaccines use cells to grow the viruses in. And just like eating a carrot is not the same as eating the soil, injecting or ingesting a vaccine is not the same as injecting or ingesting the growth medium. The final vaccine does not take on the characteristics of a human embryo or its DNA any more than a carrot takes on the characteristics of the soil it grows in. Soil contains rotting organic material, fertiliser, worms, insects, fungus, bacteria, dead animal remains and faeces. These are all vital and necessary elements that enrich the soil and ensure the carrot is nourished. It would be false to suggest a carrot contained all of those things inside it, just because it needed those things to grow. It is completely and utterly false that babies are continually aborted and supplied for vaccine manufacture. The single source for the entire world’s production of the four vaccines are descendants of lung cells of two foetuses, one aborted in the US in 1961, the other in the U. K. in 1966. Neither abortion was performed for the purposes of creating the cell lines. The cells are now replicated, so there is no need for any more fetuses. Cell lines are useful exactly because they can be replicated (copied) and they provide a reliable, uniform, controlled place to grow the vaccine virus. There is one other way foetal tissue has gone on to help in vaccine development, and that is that the rubella virus used to create the attenuated virus for rubella vaccine was isolated from a foetus aborted due to congenital rubella syndrome. Before the rubella vaccine, rubella infection during pregnancy was a leading cause of miscarriage and neonatal death, and caused hundreds of thousands of infants to be born with congenital rubella syndrome worldwide. This vaccine alone has gone on to save millions of lives. 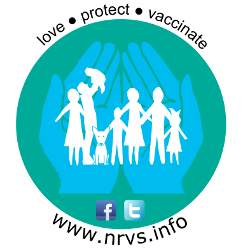 Some people may worry that vaccinating their children may go against religious or personal beliefs about abortion. However, major religions all support the practice of vaccination, including using the few vaccines grown on cell lines, and are assured that vaccines prevent disease and save lives. There are very tight and very strict laws regarding human medical waste, including aborted foetuses. There is NO reason for vaccine producers to use them as they have a perfectly acceptable and ethical resource of the existing cell lines to use.